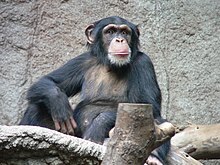 Chimpanzees (sometimes cried chimps) are ane o the twa species o the genus Pan, the ither bein the bonobo. Thegither wi gorillas, they are the anerly exclusively African species o great ape that are currently extant. Native tae sub-Saharan Africae, baith chimpanzees an bonobos are currently foond in the Congo jungle. ↑ Groves, C. P. (2005). Wilson, D. E.; Reeder, D. M, eds. Mammal Species of the World (3rd ed.). Baltimore: Johns Hopkins University Press. pp. 182–3. OCLC 62265494. ISBN 0-801-88221-4. This page wis last eeditit on 13 Januar 2017, at 18:01.